Click "start broadcast" and your Google Plus "Hangout On Air" streams live on You Tube. The recording is then automatically saved to your You Tube channel. 1. 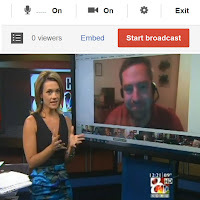 Open a Hangout On Air during a news conference and allow people to watch the Q and A live. Invite guests to suggest questions for the Police Chief, politician or superintendent holding the news conference. Or if you're like the Toronto Police Service, use a Hangout stream the news conference yourself. Reporters can join a Hangout On-Air and ask questions without leaving the newsroom. 2. Open a Hangout behind the scenes of a newscast on a laptop/computer near the news set. Point the webcam at your news set and talk to your audience during the soundbites and commercials. Before, during and after the newscast, have Hangout guests share links to news items they find interesting. Find out what they think is news. Recently, Chad LaFarge, a Hangout viewer, helped KOMU-TV gather information to cover a breaking bank robbery. 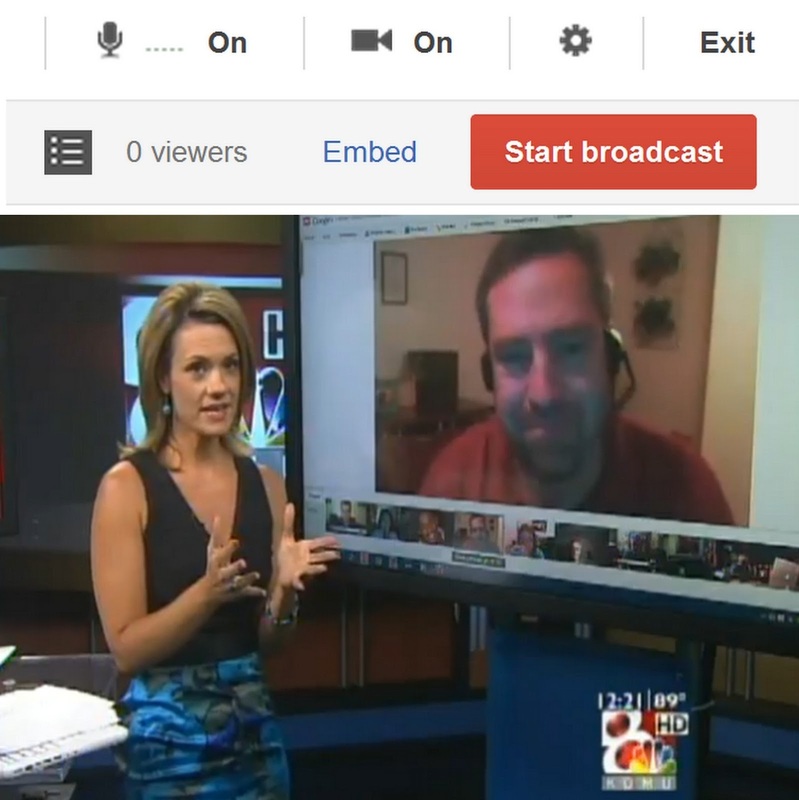 A Hangout gives a station 9 extra pairs of hands during breaking news. 3. Wear a second IFB (ear piece) so you can hear the Hangout viewers' commentary about your news stories in real time. Anchors are already skilled at being able to talk and listen to their producer at the same time. Why not listen to your audience? Work some of their comments into your newscast. 4. Use Hangouts as a free satellite truck. Hangouts operate in the middle of an international crowd sourcing tool so with public queries, you have the ability to find individuals who have experienced news events. Bring in experts virtually for live Hangout interviews and allow the other guests to ask questions. 5. Look at the most commented story on your social streams. Invite people to join a recorded or live Hangout and talk about that issue on TV face to face. This was a recent Hangout on TV discussion about whether candidates should reimburse towns for police protection during campaign stops. 6. Open a hangout during a breaking news event and show the world what you're seeing. Think of "live hanging" like live tweeting but with a face to face group conversation. Invite others to ask questions about what they're seeing. Jean Francois Desmarais opened several Hangouts On Air during the 2012 Montreal Demonstrations and invited Canadians to ask questions. 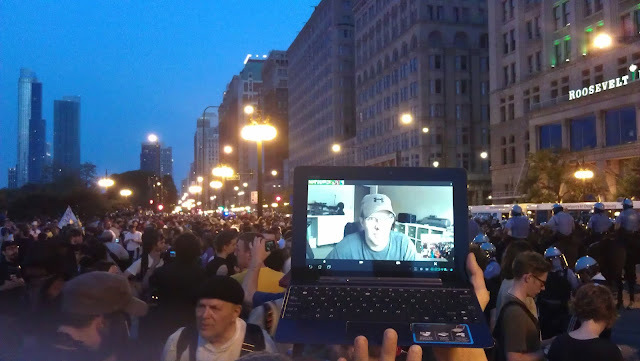 During the 2012 NATO Riots in Chicago, Dan Soto also opened up a laptop for a live hang. 7. After an in studio interview, continue the conversation by bringing that guest into a Hangout to talk with virtual viewers. Here's MyFox LA's Maria Quiban hosting a viewer chat behind the scenes with Mike Tyson. When "time spent with content" is important, this extends the life of a TV interview beyond the studio. Melissa Carlson of KRNV in Reno, Nevada uses Hangouts on her web show to get the public's opinion on talkable topics. 8. During a snow storm, go beyond a weather map. Ask the guests in your Hangout to turn their webcams out their windows and show how much snow they received. 9. Invite politicians into a Hangout to have a virtual debate where candidates answer constituent questions. You can embed the live streaming Hangout on your website. 10. Join viewer hosted Hangouts to better learn the technology and interact with your audience on another level beyond the news host---news viewer relationship. There are Hangout shows on cooking, concerts, trivia games and much more. Cliff Roth compares Hangouts to "virtual trade shows" where you find people who share your passions. Group these passions into Google Plus circles and you have a Rolodex of experts at your virtual fingertips to talk about a variety of subjects. 11. Open a Hangout during a story meeting and ask people what they think the newsroom should cover. Ok I lied. Make that 10 reasons.......... +1. Great stuff Sarah and thanks for taking my question during your interview with Tom. I didn't know how much this has already been done. Notice it's almost all Canada. This article is a great presentation tool to show others how effective this medium can become. Great article Sarah, you are definitely a pioneer of Hangouts On Air, and you're using it in a very creative way. Kudos!!! Great read. We've been using it for greater audience interacting on a couple of my podcasts. Thanks Sarah for your creativity, but do you know of any other creative way of using g+ besides using handouts. Nice job, have enjoy !